How Can I Make Sure My Dog Won’t Bite? Dogs are animals and will act accordingly. They are naturally social, usually furry and sometimes cuddly, but they are animals nonetheless. If someone pulled on your ears or face or got right in your face, could you say you would react calmly? And we’re humans. While this post focuses on training and socialization, a second post will address owner error. Are you a DIY type? Are you patient? Great! Google “You tube videos on puppy training” and take some notes. With consistency and repetition, your dog can be well trained to heed your commands. If you feel overwhelmed with training, there are plenty of professionally led classes in the Denver metro area. Becoming a dog owner is a responsibility and sometimes it takes a village to bring them up right. For young dogs in the Western suburbs, we recommend Puppesori. 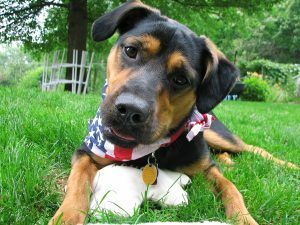 If your dog is no longer in the puppy phase try Training with Grace in the Lakewood, West Denver area. First off, if you adopt a young puppy, begin socializing the moment you become the owner. It is easier to socialize young puppies than older dogs. Reward your dog when they have a positive interaction with another dog by carrying treats and “treating’ them immediately after the good behavior. Do this while speaking in a soothing tone. It’s not so important WHAT you say but HOW you say it. Other socialization tips are: daily walks, introduce them to a wide variety of people, and know when they’ve had enough. Find more socialization tips here. Many of us are gone during the day and while we want our dog to enjoy the Colorado sunshine, please don’t chain your dog outside. Dogs are social animals and chaining them is cruel and unnecessary. So they’re a Houdini and you’re worried about them escaping? The alternatives to chaining include installing better fencing, taking them to a doggie daycare, putting in a doggie door, or giving them the security and comfort of an outdoor kennel. Your dog will be happier off a chain, and less likely to bite. According to the CDC, chained dogs are 2.8x more likely to bite than an unchained dog. But what if I want my dog to be a guard dog? Chaining creates aggression, not protectiveness. A protective dog is used to being around people and can tell when his family is being threatened. A dog learns to be protective by spending lots of time with people and by learning to know and love his human family. Leaving a dog on a chain and ignoring him will lead to aggressive behavior. Aggressive dogs can’t distinguish between a threat and a family friend, because they are not used to people. Dogs are equipped to give you unconditional love. In return, it is up to you to train them and keep them socialized so they live a happy life. You can be responsible for your dog but in the case of other dog owners, it is impossible to completely prevent dog bites. If a dog bites you, or your child, the Frickey Law Firm are experienced in helping you address your medical costs. Call us at 303-558-6179 to find out more. What Can You Do If Your Workers’ Compensation Claim Was Denied? What is an Umbrella Policy and How Does it Benefit Me? Can an Independent Contractor Receive Compensation for an Injury? What if You Woke Up With a Foreign Accent? Do You Know How Damaging a Brain Injury Can Be? Blame the Hospital for a Child’s Brain Injury? Overworked, Overtired … Under the Radar? Liability Waivers – Fact or Fiction? How Do Employers Reduce the Number of Workplace Injuries? Tis The Season To Be . . . Wary? Seat Belts – Nuisance or Necessity? Is Medical Marijuana Use by Colorado Drivers Increasing?